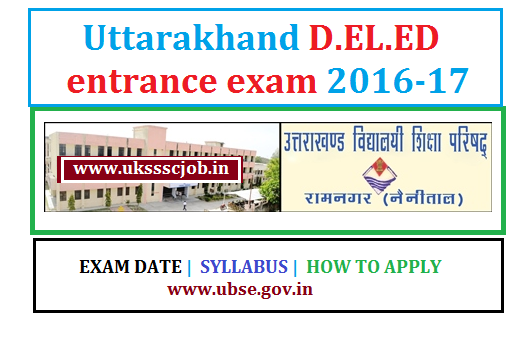 Here you can check Uttarakhand D.El.Ed Training 2016 Admission.visit ubse.gov.in for complete details. If you want to apply for the Uttarakhand D.El.Ed Training Admission for the year 2019-20. There will be an offline Application submitted to ubse Ramnagar. Candidates should have a Graduation Degree from a recognized University . AGE : Candidates Age limit between 19-30 years as per the date 1st July 2017, then you are eligible to apply for D.El.Ed Admission in Uttarakhand. The application fee may be Rs.350/- for general and OBC category candidates. However the application fee for the SC/ST and the PWD may be Rs.175/- and Rs.100/- respectively. The exam paper will have 200 multiple choice questions of one mark. The questions will be taken from the following topics general knowledge, reasoning, numerical ability and teaching interest based on the degree level. 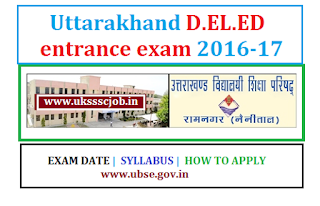 Last Date of submitting application form for Uttarakhand Diet D.El.ed entrance exam 2017 is 30 Novmber 2016. Tentative Date of Examination of Uttrakhand D.El.Ed training Admission 2017 will be declared latter. Candidate can buy application form from selected Post offices by 1 nov 2016 onwords to 23 nov 2016.